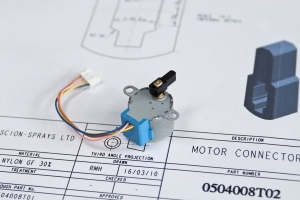 When it needed fully functioning prototypes for an affordable, engine management system to impress a potential customer, Scion-Sprays Ltd chose the rapid manufacturing services of Proto Labs. Thankfully, one company in the East of England has developed another solution - and after years in development has recently secured their first commercial order. 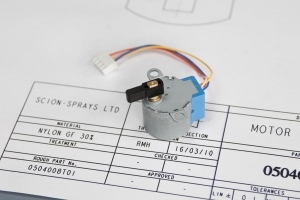 Scion-Sprays Ltd is made up of a group of engineers specialising in the development and manufacturing of affordable engine management systems that will give its OEM customers a real competitive advantage. 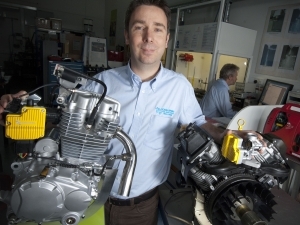 Richard Hoolahan, Manufacturing Manager, explains: "Our first commercial product is a fuel injection system specifically designed for a European manufacturer of light motorcycles and scooters. This new system will cut emissions of HC+NOx (the cause of photochemical air pollution) by around 35 per cent, and CO emissions by over 80 per cent compared with a standard engine. It will also save 30 per cent on fuel." Founded in 2002 by Jeff Allen (a former Chief Engineer at Lotus Engineering) the firm grew out of research into the electrostatic atomisation of fuel. In the process, Jeff (who is now the firm's Technical Director) came up with the idea of a small, low-cost 'constant volume displacement pump' to control fuel flow rates. As Richard says: "That pump proved to have greater market potential than the original research because of its efficient, clean-burn credentials and its simplicity." So with backing from an 'angel' investor, who saw both the business and the environmental benefits of the technology, Jeff and a small team set about developing Scion-Sprays' innovative engine management system called Pulse Count Injection (PCI) and with the help of rapid prototyping services Firstcut and Protomold from Proto Labs, are now moving out of development and into production. PCI works by calculating the amount of fuel needed in each engine cycle and then applying a precise number of pulses of a fixed volume of fuel across the cycle. 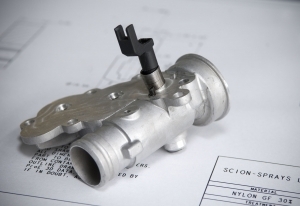 By 2006, Scion-Sprays had produced their first working PCI prototype, which in turn led to the development of a fully integrated Quantum Fuel Injection (QFIä) system. 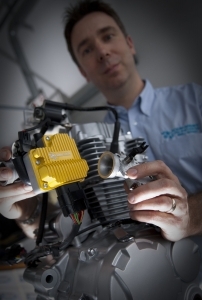 The modular design of the QFI system includes a throttle body (designed by Richard when he was the company's Design Engineer), PCI technology, sensors, idle control and ignition. Because it has no high pressure pump and significantly fewer moving parts, QFI is simpler to build and maintain than a standard fuel injection system based on Pulse Width Modulation (PWM). Nevertheless, PCI technology enables QFI to deliver metered fuel bursts at up to 1000Hz and fuel atomisation at 50-80 microns SMD. 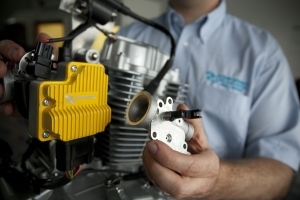 This combination of accuracy, reliability and "smart controls", along with its low unit cost, makes QFI ideal for motorcycles and mopeds up to 250cc, and small utility-engines (such as those found in lawnmowers, strimmers and leaf-blowers), which cannot justify the additional cost of a standard PWM system. An added attraction for OEMs is that the throttle body matches the carburettor footprint in existing engine designs with minimum additional wiring and sensors and QFI-enabled engines are also Euro 3 and China Stage 3 emissions compliant, and bio-fuel compatible. It was while developing a prototype of their QFI for a prospective European customer in the early part of 2010 that Richard turned to Proto Labs. "I needed about 15-20 pre-production QFI systems for customer-testing, which meant they had to be fully functional and made from similar, if not the same materials that would be used in actual production units. I used different rapid prototyping services to produce less-critical components," says Richard, "but chose Proto Labs for the throttle crank and the stepper motor arm because there could be no compromises in the mechanical qualities of those parts: and the production method and the materials would be very similar to what we would use in the final version." Richard decided to use Proto Labs' Protomold injection-moulding service to produce the stepper motor arm from glass-reinforced nylon. However, he says: "I chose Firstcut's machining service to make the throttle crank from the same material, partly because I wanted to compare the processes and partly because creating a mould for the throttle crank would not have been cost-effective. At this stage in the product development, it is very important to minimise costs." Richard contacted Proto Labs using the company's two interactive, online quotation systems: Protoquote and Firstquote. Both systems let him upload his 3D CAD models and then within hours sent back an accurate quote - not an estimate. "I was very impressed with the process," says Richard, "it was so easy. Online quoting systems rarely work as advertised, but this time they did. The Proto Labs systems gave us a complete price based on our CAD models; a price that was updated instantly when we changed the quantity or material, so we knew what we would pay for what we wanted. I also liked the personal touch! For example, Protomold suggested a small, design refinement, in this case adding draft angles to help release the motor arm from the mould." The machined parts were delivered within three days of Richard accepting the quote: "And that was their standard delivery - they can do it even faster if want. The moulded parts took slightly longer but that is because the tooling required. Nevertheless, they were with me in a matter of days, not months, like other suppliers." Overall, Richard was he was very impressed with the service, including the quality of the finished components: "Proto Labs delivered exactly what they said they could which was exactly what I wanted. The QFI system performed as it was designed to and, as a result, we secured our first commercial order from that European motorcycle maker worth EUR4 million over the next 3 years."